Nope, we didn't stutter. This 4,928-foot mountain gets its name from Arno Cammerer, the director of the National Park Service from 1933 to 1940. During his run as director, Cammerer was instrumental in establishing national park status for the Great Smoky Mountains. Cammerer (the mountain, not the man) was formerly known as “White Rock,” so named for the brilliant thunderhead sandstone that protrudes from the mountain near its summit. 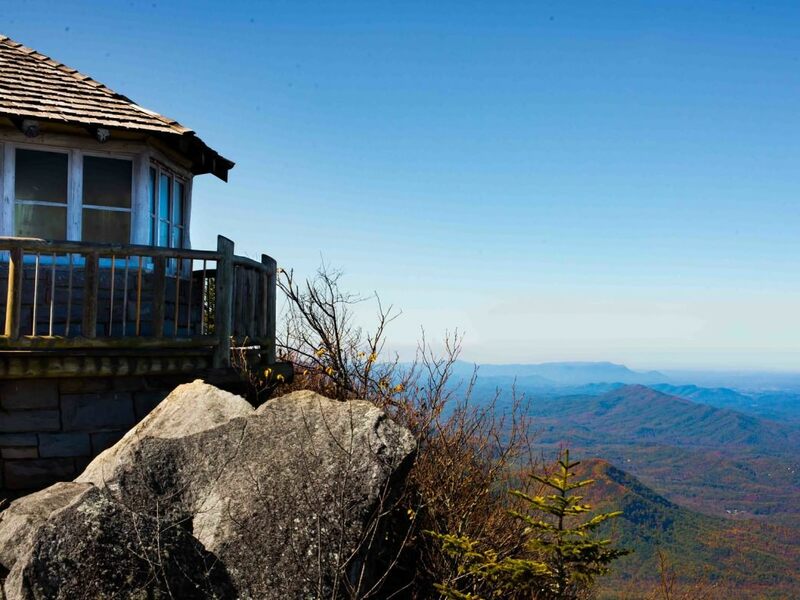 These same types of rock were used in constructing the beautiful lookout tower at the summit of Cammerer, which draws many dexterous visitors to this sentinel summit every year. Considered one of the top two or three best views in the Smokies, Cammerer also forms part of the historic Appalachian Trail, and is one of the last major overlooks for northbound AT thru-hikers before exiting the park. With such a monumental mountain, we thought it a shame to only give you one way of experiencing it. So here are three great ways to traverse Cammerer. Oh, one more thing: We need to warn you upfront that bears are very active in this area. If you see one, keep your distance, stay calm, and move away. 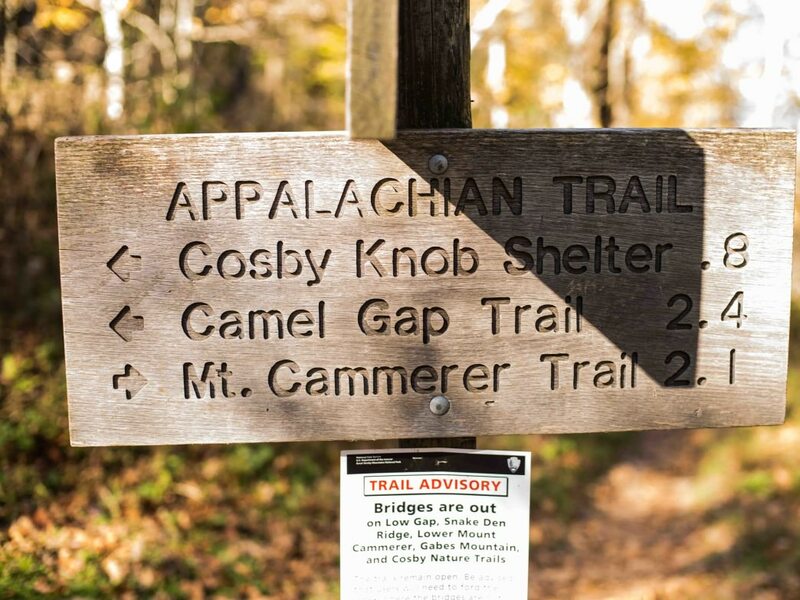 The access to Mount Cammerer via the Cosby Campground is the most convenient access point for hikers coming from Knoxville. This is also the shortest hike to the summit available, at around 12 miles. If you want to spend a night under the stars before hitting the trail, we strongly encourage you to spend a night at Cosby Campground. Out-of-the-way of the main Smoky Mountain thoroughfares, Cosby is a favorite among locals. 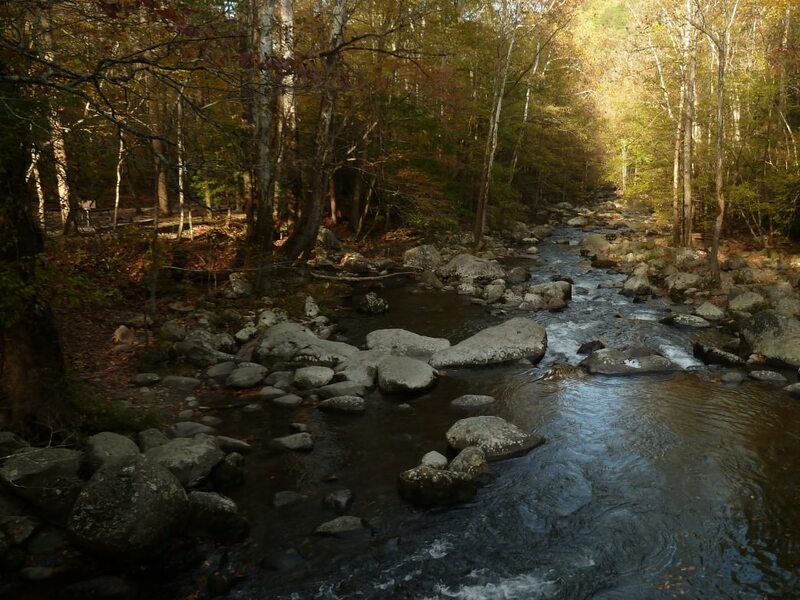 The surrounding area has all the Appalachian history, splendor, and immersive intimacy you could ask for without the crowds found in most of the park’s campgrounds. Among its historic claims: This area was the birthplace of “poet laureate of the Smokies” Ella Costner and also was once a hotbed for moonshining and illegal stills. Today, the campground is a sleepy little circuit of tent spots (with a few RV spots, too) that’s rarely ever full, even on holidays and busy Smoky Mountain seasons. If you’re not spending the night (or if your checkout time comes before you plan to make it back down the mountain), make sure you park at the large hiker parking lot for Low Gap trailhead. This parking lot can be found just past the campground entrance station on the left. From the parking lot you’ll set off down the nearby Low Gap Trail, weaving through a pretty little area adjacent to the campground for .4 miles. There are several short nature trails and unofficial spurs here, so make sure you stay on the Low Gap Trail. This trail climbs for three miles through beautiful forests of buckeye, maple, and rhododendron. The hike never gets super steep, but it is still quite challenging due to the constant, unwavering climb. But don’t worry, with the beautiful green world enveloping you as you go, you’ll find plenty of excuses to stop, breathe, and take it all in. Eventually, Low Gap will intersect with the Appalachian Trail, and you can rest easy knowing the toughest part of your trek is over. Turn left onto the Appalachian Trail to begin the second major leg of the hike. By this point, you’ve already climbed 2,000 feet of your roughly 3,000 feet in total elevation gain, so the coming 2-mile stint will bring much less climbing and many more views, specifically those of Toms Creek and Cosby Valley. You’ll also get that difficult-to-describe “it” factor that comes with being on the AT: The narrow, deeply ground-in curve of the trail snaking away in the distance, the feel of thousand of stories that have unfolded along the 2,000-plus mile line—there’s really nothing like it. 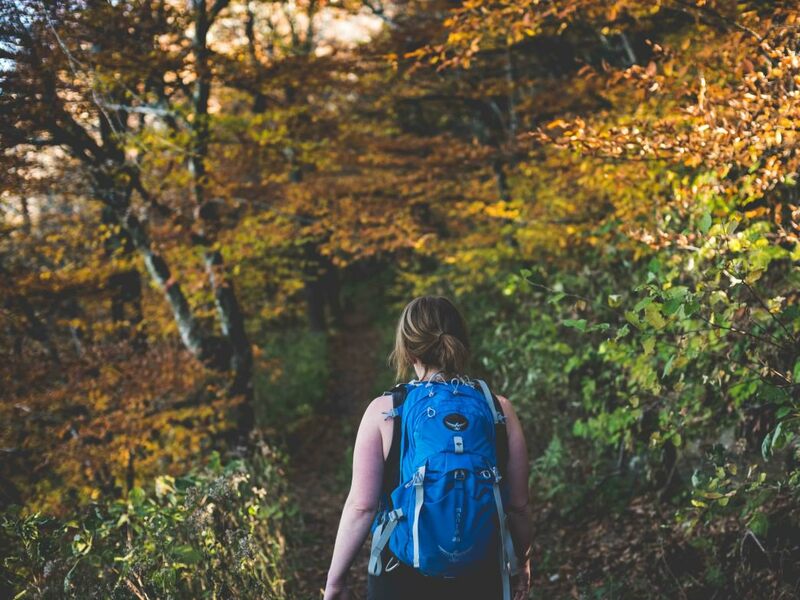 Depending on what time of year you’re hiking, you may even come across a few thru-hikers on their way north to the trail’s northern terminus at Mount Katahdin or south to the endpoint at Springer Mountain. Far before you’ve gotten your fill of these great views, you’ll reach the short spur trail to Mt. Cammerer. Once you start scrambling over rocks and are suddenly closed in by the high hedge walls of laurel, you’ll know you’ve almost made it to the lookout tower. The tower was built 1937 by the Civilian Conservation Corps, the stone hand-quarried from nearby rocks then shaped and set on site. The tower was built to spot fire and smoke before modern fire-detection methods were developed. When you’ve thoroughly taken in the craftsmanship of the tower and the beautiful panorama view-able from its balcony, head back down the trail the way you came, all the way back to Cosby Campground. Getting to Cosby Campground : From Knoxville, take I-40 East for about 50 miles. Take exit 440 and follow US-321/TN-32 S toward Wilton Springs Road/Gatlinburg for 13 miles. Turn right onto Cosby Entrance Road. Continue until you reach the Cosby Campground. Begin on the Chestnut Branch Trail, which runs beside a picturesque creek that plunges its way through a rhododendron-filled holler for the first 1.5 miles. You will share this section of trail with a group of stoic, old-growth oak trees, which were lucky enough to survive the pre-park logging rush of the 1930s. Turning right and leaving the creekside, the trail begins to gain elevation toward the ridgeline and its intersection with the Appalachian Trail. This intersection is clearly signed and from here you will follow the AT south for three miles to the Mt. Cammerer spur trail. After two miles on the AT you will come to a photo-worthy rock outcropping on your left that overlooks the Big Creek watershed. From here, continue through a fragrant grove of large hemlocks and balsam fir. Upon gaining the ridgeline hikers will see a clearly marked intersection for the spur trail that leads to the summit of Mt. Cammerer and the lookout tower. Take your time and relish the last .6 miles of easy trail to the summit as you capture sneak peeks of the views through a tunnel of mountain laurel. A short scramble up an easy rocky section allows your first glimpse of the lookout tower and its 360-degree views. Getting to the Big Creek Ranger Station : From Asheville, drive west on Interstate 40 to the North Carolina/Tennessee line and take exit 451 for Waterville. At the stop sign take a left, cross the large concrete bridge over the Pigeon River and veer left onto Waterville Rd. Enjoy the close up views of the Pigeon River and be entertained by throngs of rafters, in the summer months, as you drive on Waterville Road for two miles towards a four-way stop. Follow the signs for Big Creek as you continue straight through this intersection. In .2 miles the Big Creek Ranger Station and your trailhead will be on your right. Finally, we have a Cammerer trip for those who want to spend a night high up in the mountains. This 20-mile loop is not for the faint of heart. 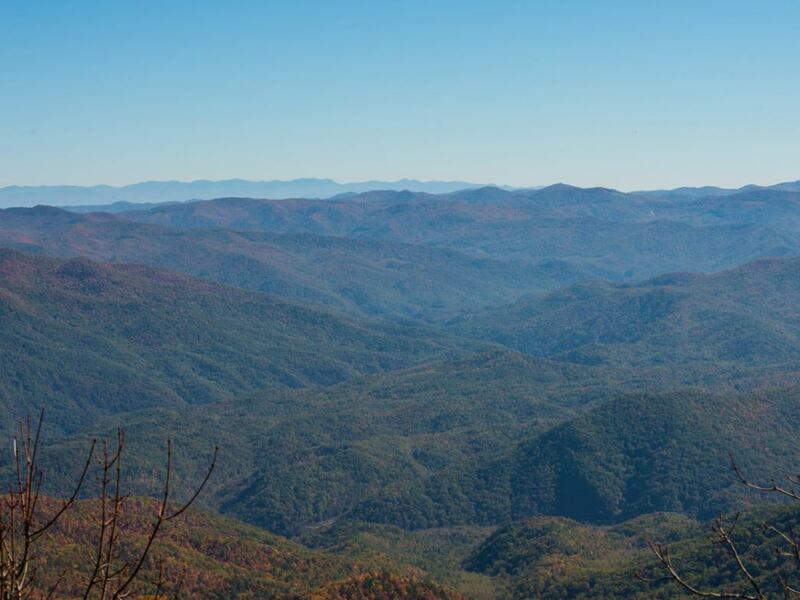 It climbs steeply up the 5.7-mile Snake Den Ridge Trail, follows the AT on the ridgeline for 9 miles, and then descends 7.4 miles down the Lower Mount Cammerer Trail. 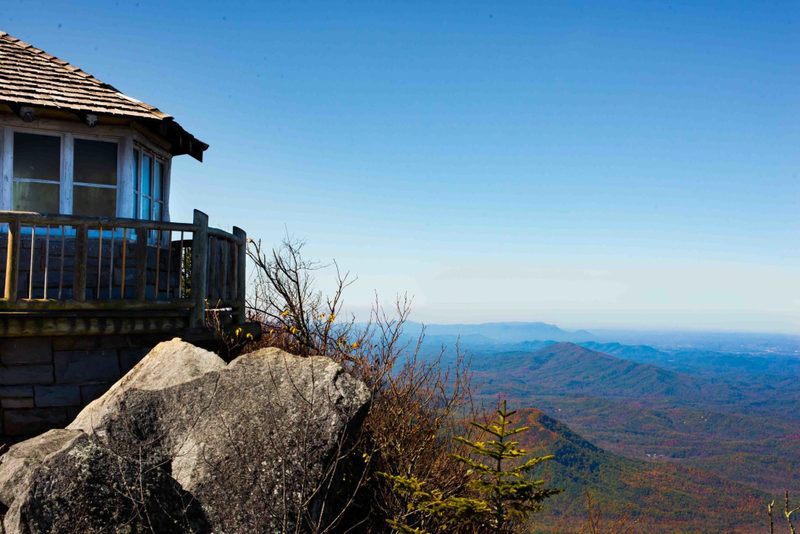 But if you’re up for it, you’ll be rewarded with a high-altitude night camping at Cosby Knob, lots of nice AT vibes, and, of course, the views from Mt. Cammerer. 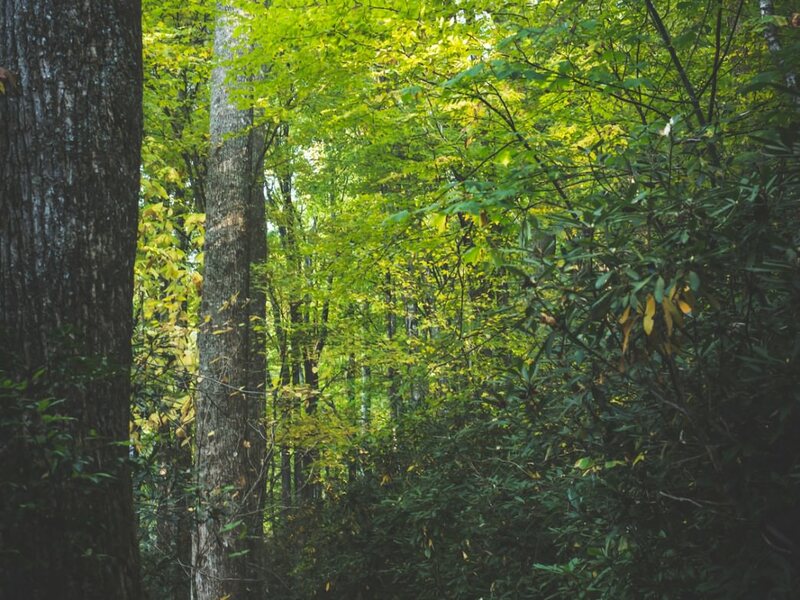 With so many trail junctions, we encourage anyone attempting this hike to invest in a solid topographical map like the Great Smoky Mountains map put out by National Geographic. You’ll need to park in the hiker lot at the Cosby Campground (see Cosby Campground guide above) and walk southwest across the campground to the Snake Den Ridge trailhead, located across from campsite B51. From here, follow the gravel road for .3 miles, then turn right to stay on the Snake Den Ridge Trail toward the Appalachian Trail. Keep your eye out for an old cemetery, which contains the grave of poet Ella Costner. The gravel road dead-ends a mile later in a cul-de-sac, but Snake Den continues at the far end, marked by a line of rocks. The trail descends to cross Rock Creek and then begins its largely unwavering uphill climb, gaining about 3,000 feet over its 5.3-mile stretch. This trail is a very pretty climb, with lots of rhododendron and a small waterfall at the Inadu Creek crossing. As the trail climbs toward its intersection with the Maddron Bald Trail, your surroundings will begin to include a few more evergreen trees and eventually views of Inadu Knob and Old Black, just past the Maddron Bald junction. Continue on for .7 miles to the Appalachian Trail junction, just before which you might see remnants of the wreckage from an F4 Phantom fighter jet that crashed nearby in 1984. Once you reach the AT, turn left and follow it for 2 miles to Camel Hump Knob and continue on a couple more miles to your high-mountain hotel: the Cosby Knob Shelter. This is actually a pretty nice shelter and seems to have been renovated recently. Light a crackling fire in the fireplace, cook up a great backcountry dinner, and get plenty of rest for the long hike the next day. In the morning, continue on past the Low Gap Junction on up the gentle 2-mile climb to the Cammerer spur trail and on up to the summit. Take some time to take in the view, snap a few pictures, and maybe eat a quick lunch before descending back down the spur and continuing northbound on the AT. In a couple miles you’ll reach the AT’s junction with the Lower Mount Cammerer Trail. It's time to begin your descent. Turn left onto the Lower Mount Cammerer Trail and descend down a gentle decline for 7.4 miles. You’ll cross several hop-able streams, and reach a campsite (35) after 3.8 miles. After 2.5 more miles, you'll get to Sutton Ridge, where a side trail can take you quickly to an stunning overlook of the Cosby Valley below. Continue your descent down across Toms Creek, and hike down another mile until you reach a gravel road. Sound familiar? That’s because you’re almost back to your car. 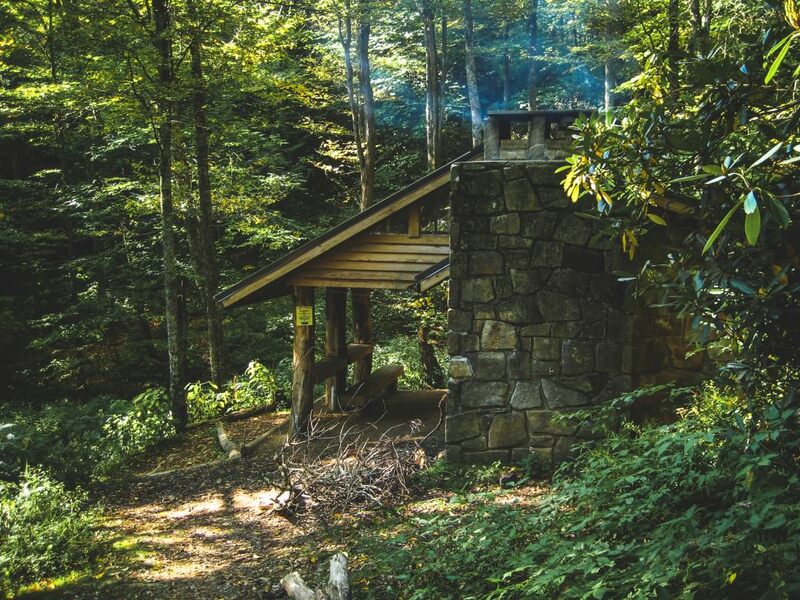 Follow signs for the Cosby Campground and the hiker parking lot and soon you’ll be home free—with a weekend’s worth of stories from one of the most beautiful places in the Smoky Mountains.